A couple weeks ago, I had the pleasure of going into one of the finest places underground NYC. Crown Finish Cave. Many of you may be familiar with the term “affinage”( the infinitive, Affiner) – a french word derived from Latin “ad finis” meaning “towards the limit.” Affinage, as it relates to cheese, is the act of caring for cheeses as they age so that they may reach their limit of perfection and then sold at peak ripeness for consumption. An Affineur is someone who cares for the cheese to reach this limit. Crown Finish Cave and Parish Hill Creamery have partnered in this underground endeavor. Sam and Benton (of Parish Hill creamery) are the affineurs at Crown Finish Cave and have worked hard putting this cave together and caring for the cheeses. 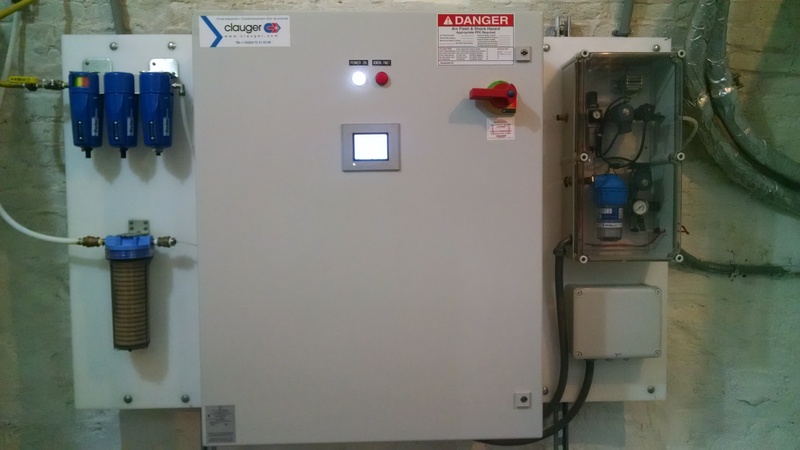 What was originally used as a lagering cellar, and most recently as an old storage facility, the space has returned back full circle storing and aging fermented foodstuffs. 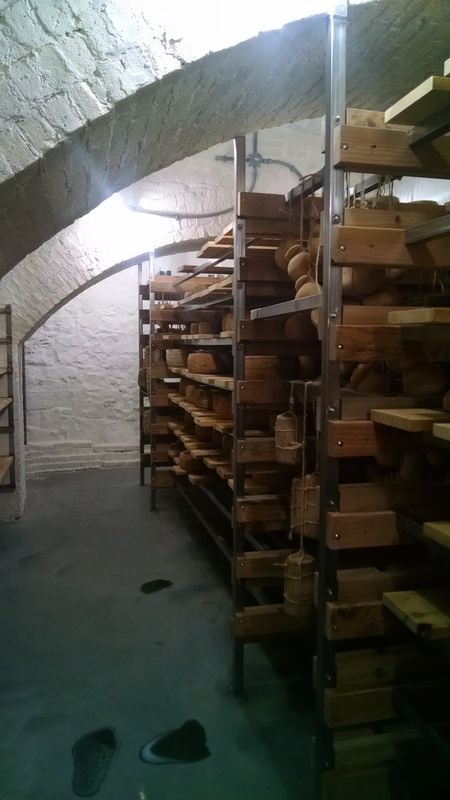 The beautiful brick arched space has been thoroughly cleaned and outfitted with state-of-the-art technology to help keep the cheese healthy and aging properly. 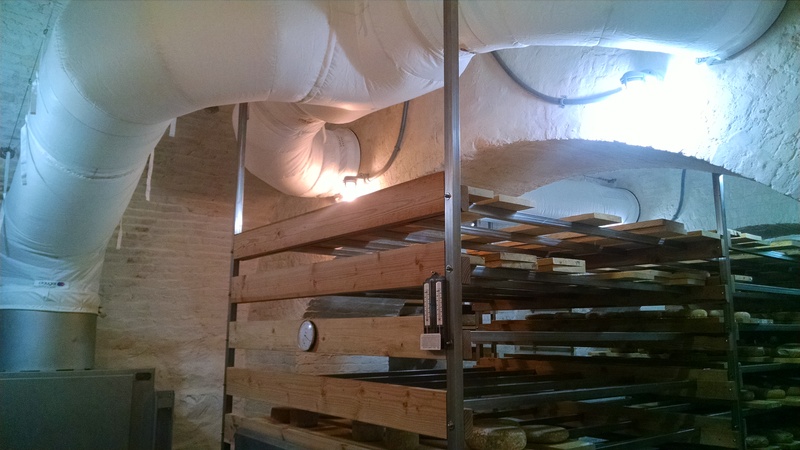 To keep mold healthy and thriving and (the by-product) ammonia vented but prevent air from circulating too quickly as to not dry out the cheese, caves need proper air circulation and humidity . Through research and consulting, Benton was turned on to the top-of-the-line French company specializing in air treatment, Clauger. 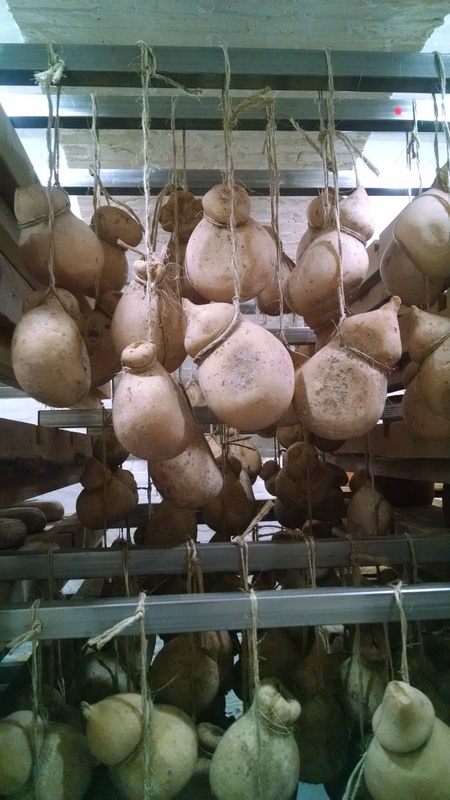 This even air flow and consistent humidity provide ideal conditions for growing mold and aging cheese. Each style of cheese is labeled with type and date and placed on a wood board that sits nicely on the metal frame. Each wooden board pulls out from the metal frame when cheese needs to be washed, brushed, or flipped, and then slid back in. 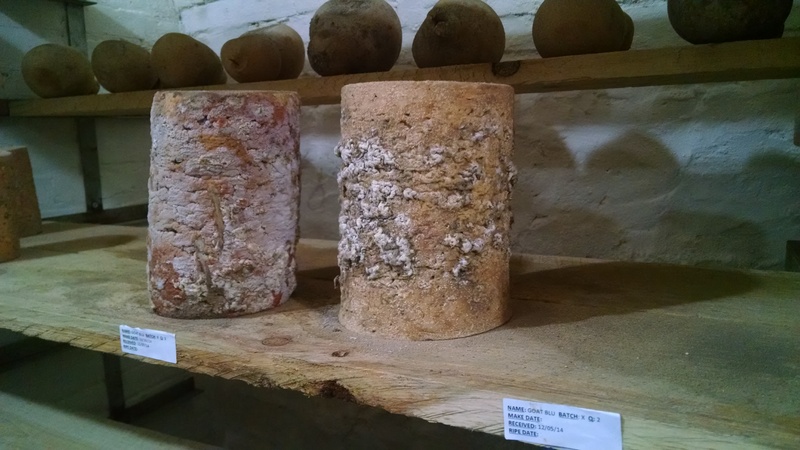 The cave also holds cheese from local creameries around the New York City area. With the cave being in its infancy stages, there are currently few cheeses from other dairies but there is hope to expand out of the one room and into all five rooms of the cave. Here, many Suffolk Punch hang. Suffolk punch is a pasta filata cheese, curd stretched by hand and hung to dry and age. Sam and Benton have taken on two wheels of experimental goats’ milk cheeses from respected cheesemakers to see how the cheese will age. A lot of cheesemaking and aging is science, another portion is a combination of experience and experimentation. 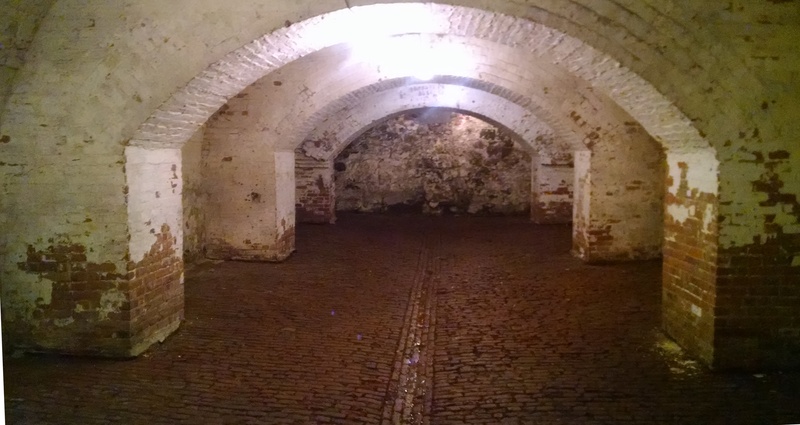 Since the caves had once been an old lagering facility, it is possible that the yeasts used during beer fermentation may still lay dormant in the space. 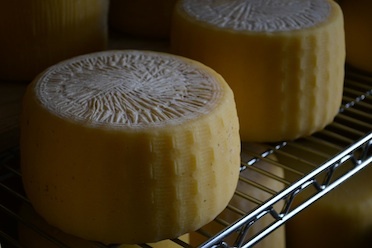 The slightly moist, acidic, and salty cheese may be the perfect medium for these yeasts to begin growing again – adding their own specific flavor to the cheese and providing a unique Crown Heights, Brooklyn terroir. I do look forward to tasting Brooklyn via cheese. Categories: Affinage | Tags: Affinage, Brooklyn, Caves, Crown Finish Cave, Crown Heights, Parish Hill Creamery | Permalink. 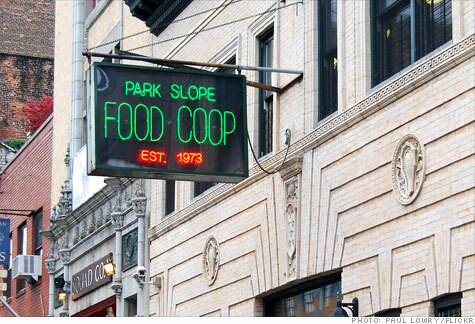 I attended a cheese event at the Park Slope Food Co-Op a couple weeks ago. The event was hosted by Aaron Kirtz, sales manager at Forever Cheese and Co-Op member; and was presented by Sam Frank, affineur at Crown Finish Caves in Crown Heights, Brooklyn and Cara Warren, general manager and cheese buyer at Greene Grape Provisions. Although there was plenty of food for thought, no cheese event could be complete without a cheese tasting. While we did taste some domestic washed rind cheeses celebrated by the Co-Op, the true highlights of the evening were the Parish Hill Creamery cheeses brought from Crown Finish Cave. Crown Finish Cave is a retrofitted old lagering cellar located tens of feet under Crown Heights Brooklyn and is home to adolescent and aged and ready-to-eat cheeses from Parish Hill Creamery, in Westminster West, VT. Only using 1 of the available 5 rooms in the cellar, the Cave also assists other nearby dairies to age their cheeses to perfection. Here are some Brooklyn-aged Parish Hill Creamery cheeses that we tried that night. 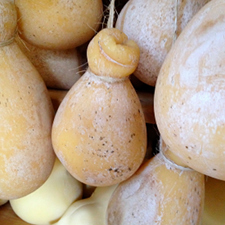 A classic pasta filata style or hand-stretched curd cheese – which is how it acquires its gourd-like shape. Made in a similar style to the Italian cheese Caciocavallo, this cheese is both buttery and tangy. 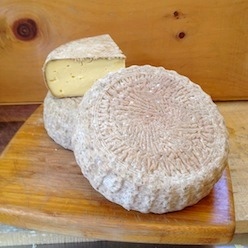 Parish Hill uses – kid (goat) rennet paste which gives this cow’s milk cheese somewhat of a “goaty” flavor, but a noticeably smoother texture. Kashar is styled after Eastern European provolone. A hand-stretched curd – pasta filata style cheese – that is placed in a mold and aged at least 60 days. The paste has a beautiful ivory color and flavor of a great young provolone, not overly sharp while the pasta filata style “grainy” texture, like dough. The Humble Herdsman is a tomme style cheese washed with Virtue Co. Red Streak hard cider. It has the rich taste of peanuts with sweeter rind of fruit and definite apple notes from the hard cider. Although this cheese has been aged for a few months, washing the rind gave the paste a supple and fudgy texture. 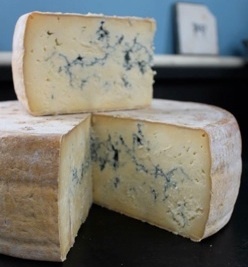 The West West Blue is Gorgonzola style with a sweet mold and tastes a bit like a stilton. While all of the Parish Hill Creamery cheeses were interesting in taste and recipe, this one intrigued me the most. It is a “2 day curd” cheese: On the first day of the cheese make, the curds are made but are left out to cool and become acidic. The next day, the freshly produced warm, fresh curd are placed on the bottom & sides of the mold with the previous day’s cold curd on the inside because the old curds do not “knit” or press together as well. The gaps between curds leave room for air to enter and so, blue mold. Categories: Event | Tags: Brooklyn, Crown Finish Cave, Event, Food Coop, Parish Hill Creamery, Park Slope | Permalink.